Capel-y-ffin | Where Angells Tread! Today’s walk is a nice change from our recent expeditions. 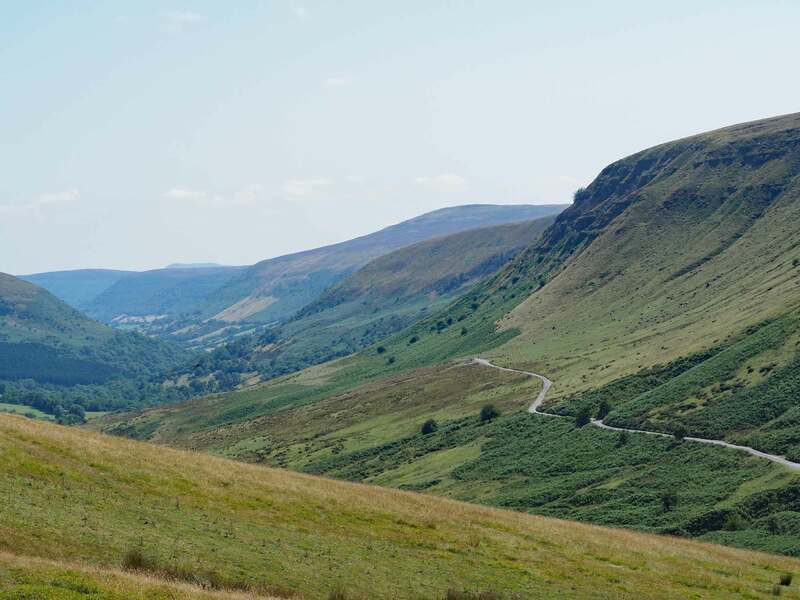 We’re off to the Black Mountains. Arriving at Capel-y-finn we’re greeted by a gaggle of old people with walking poles…we know from previous experience they can be ‘doughty competitors’ so we’re pleased to see them head off up the valley as we skirt the chapel and head south towards Vision Farm. From just above the Farm we head up the side of the valley. In today’s heat this is tough going and several times we stop for water. However the view from the top is worth it. We pause for an early lunch. The Pile of Stones (to use the OS map description!) 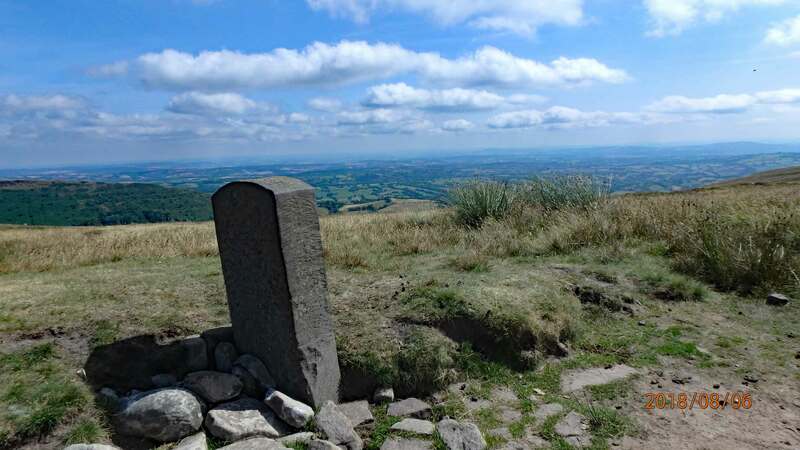 marks the route of Offa’s Dyke and the Boundary between England and Wales…and we briefly debate whether to follow Offa’s Dyke along the top to Hay Bluff. Instead we opt for the challenge! We’re back to civilization as we drop down into the Olchan Valley with some great views beyond into the ‘Golden Valley‘. Off the top there’s not a breadth of air today. Slowly we follow the road, and then the track, along and then up, out of the valley. We’re grateful for what little shade there is. As we near the top we’re greeted by a family with their 80+ year old granny, who’s jumping from rock to rock like a mountain goat. As we wearily trudge passed she cheerily announces that ‘the view from the top is terrific!’ I’m sure it’s meant well but it does little to lift my spirits! It turns out, she’s right. On the top today there are spectacular views back along the Olchan Valley and then, from Hay Bluff, across to Hay and beyond into the heart of Wales. We discover our walking pole wielding walking group at the Bluff and I’m secretly rather pleased to see most of them flaked out at the trig point…before realizing that maybe we’ve still got to walk that part of the route. As it turns out, it’s an easy walk as far as Gospel Pass but the drop down into the Pass followed by the steep climb to Twmpa is not greeted with much enthusiasm by either of us. That’s the last climb of the walk and we enjoy the heather and moorland ponies on the top. 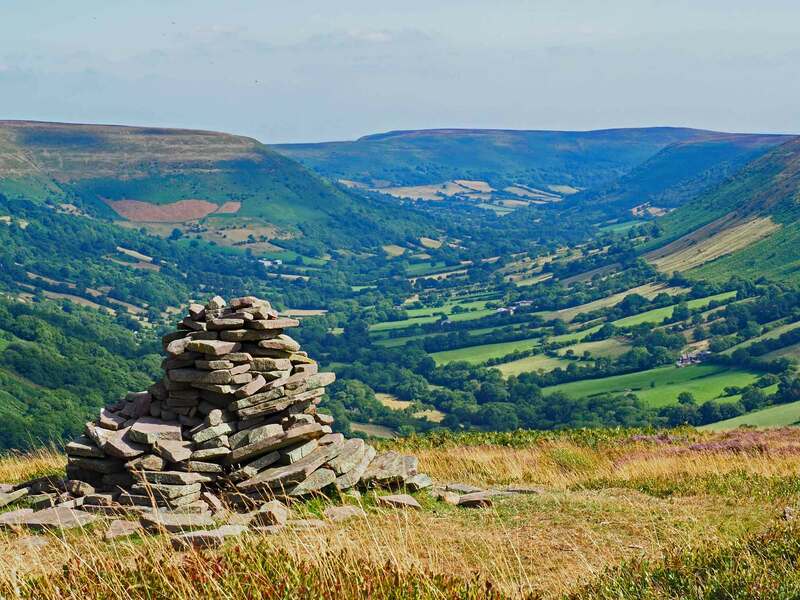 By the time we’re approaching Capel-y-finn it’s mid-afternoon and there are more lovely views of the village and beyond towards Llanthony. It’s a really enjoyable 11.4 mile walk…nevertheless the walking pensioners still make it back before us and are long gone by the time we wearily climb into to car.